Quick Production, High Quality concrete Blocks, Very Less maintenance Electrical circuit is designed to avoid manual error.Very good service, Any mould as per customers specification. 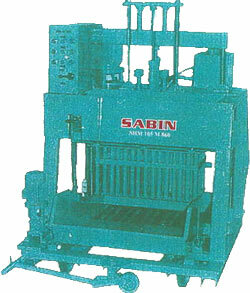 This is a mobile type concrete Block making machine and hence will produce Blocks on concrete floor. Any type of concrete Blocks can be made by fixing different type of mould and RAM into the machine. Details of Materials to be used : Cement, Crusher chips, crusher Power, sand and water Mixing Ratio for one bag cement Number of Blocks can be made in the mixing. Special Type - 16 Blocks per Stroke.